Greenwood Brewing boasts beer made for women by a woman. It highlights the experience of drinking beer and the sense of adventure and creativity it provides. Megan Greenwood, the founder, is working hard to create representative beers to encourage women (and men!) from all walks of life to get together, discuss exciting topics, laugh, learn a little about beer and drink a delicious beverage along the way. In an industry that’s perceived to be male dominant, it’s exciting to spotlight an amazing woman in beer to help change that perception. Megan shares what it’s like developing a female-focused beer brand and why she started Greenwood Brewing. What motivated you to make your mark on the traditionally male-dominated beer scene? Beer is intimidating. If you’ve ever sat around a table of 4 men who all are talking about beer, and the brewery you’re at, and how great it is, and then all the sudden the server is at your side, and asking you for your order before you even know what half the menu means! “Whatever he’s having.” And then we hate it because it’s a quadruple IPA. I had no idea what to drink when I first started drinking beer, and I want to make that easier for women. As I’ve been brewing, I’ve learned that most of my fellow brewing colleagues don’t consider women when creating beer. I’m not saying they’re thinking of men, but just not women. And women are different: we purchase differently, we consume differently, we see a beer bottle and we think, “oooh. have I had my calories for the day?” or what my best friend asks “what does it do for me?” How many men do you hear these same questions? I don’t think we need to compromise when it comes to drinking a beer, that is mentally stimulating, great tasting, easy to order, and we don’t feel like we just ate-an-entire-loaf-of-bread afterward. That’s at least a few of the reasons behind Greenwood Brewing. Women are different and we should be considered when creating a product. What would you say the core value of your brand is? Women empowerment. But I heard you should always explain values in the form of a verb, so empowering women to understand herself, create change, or even challenge the status quo. We want to give women a reliable product that she can consume confidently, allowing her to be her best self for the rest of the day. A pub, or public house, is an establishment known for serving alcohol such as beer. They were often considered the focal point of a community – why do you think beer in particular is great at bringing people together and inducing great conversation? Beer makes people honest! I’ve definitely said some of my most honest thoughts with rosy cheeks after a few beers, ha! But also I’ve had some of my favorite ideas talking with my best friends over a couple of beers – in fact I’m drinking one now. Beer is our gateway from an exhausting day to laughter and dancing. It helps us take our minds off of trivial activities and stimulates creative thinking. And how better to do that than with other people who want the same thing! Ha! I wish I could say yes. But I began drinking beer on beer that still makes me cringe (Busch light aside, that is still near and dear to my heart). It wasn’t until I was out of college that the craft beer scene really began taking off and tasty beer was an option. And then I drank a pale ale with BBQ, and life was never the same. When did you discover your love for brewing? A friend gave me a 5 gallon brewery kit for my birthday and I fell in love. I babysat that beer every day. Even our new brews make me so happy when they start fermenting. It’s the greatest feeling after 4 weeks to take that first taste of your hard work, sweat and sometimes tears. And! That product is beer! Heck yeah. What are some of the challenges you have faced with your startup? Losing the vision. It’s so easy to lose sight of your vision when starting up: money, status, time, society, popularity, opinions, it’s-never-been-done-before or that’s-not-how-we-do-it attitudes. Remembering why I started in the first place brings me back to the vision. Keeping mindful of maintaining confidence and trust in yourself and your process. If you had to choose a single beer to drink for a full year, what would it be? Pliny the Elder from Russian River Brewing. I was lucky enough to taste the Pliny last year, and like a college student, it is proudly standing above my cupboards for all my visitors to see. What are you working on that you’re most excited about right now? I am SO excited about Herstory Brew. We are creating a full line of beer that will constantly rotate around inspirational, fabulous, and badass women throughout history and of-today. We will spotlight how she was empowered in her life, and our beer will be telling her story. Stay tuned. When you’re not busy being a crafty lady, what can we find you doing in your spare time? Life has so much to offer. An ideal day would be seeing friends and family, riding a horse, playing guitar and sneaking-in a competitive nintendo 64 Dr. Mario game, read a fun and fictional novel, and cook a delicious and healthy meal followed by dancing to some live blues music. I can say I’ve never had that day, but by-golly I am working toward it now. What’s your “keep me going” quote? At this exact moment it’s “you have to spend money to make money,” the timing being the price tag associated with some of my non-negotiables. But I constantly remind myself that “We have to dare to be ourselves however frightening or strange that self may prove to be” – May Sarton. It’s easy to fall into the trap of people-pleasing, and I’ve worked in sales my entire career. We need to continue to remember that being our authentic selves is our only option, no matter how uncomfortable it might make other people feel. Without a doubt Pocahontas as the Disney version, as we know she isn’t fictional. The Disney (and possibly John Smith) version is my favorite. If you could have dinner with anyone, dead or alive, who would you have dinner with? Gosh this is such a hard one. Honestly, I would probably choose my Grandmother Grace Greenwood. She died of ovarian cancer in her 40s with 8 children (7 boys and 1 girl!). I have a feeling that my creative spirit comes from her and I imagine she was so pleasant, intelligent and empathetic… and patient! 8 kids! I would love to meet her and hear her story. 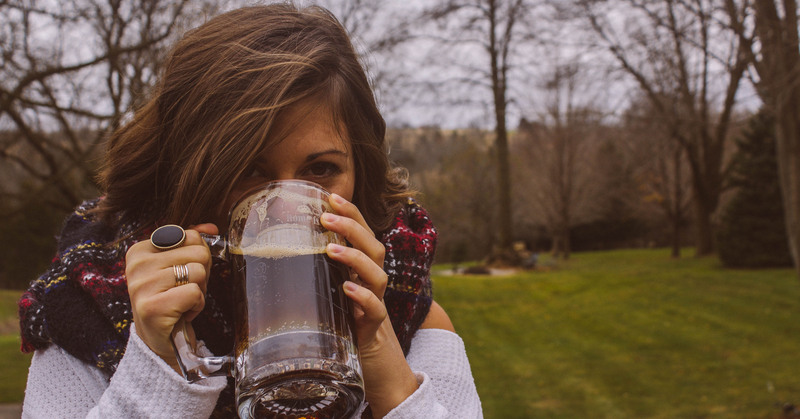 How would you encourage women to find their “beer” palate? Taste beer. A lot of places will give you a half pour instead of a full pour, just to taste new beers. The more you try and explore, the more you’ll learn the flavors you like. Also, obviously follow us on social media! We will definitely be showing you how to find your taste for beer. What is one thing or piece of advice that you want people to walk away remembering? Ask yourself what is one thing you do that makes you happiest at your absolute core. Every time you do it, you love it and thinking about it gets you excited. Then think about one thing that either breaks your heart or that every time you think about it, it makes you want to do something to change it. Combine the two together. Now, all we need to do is find a job, create a job, or figure out a way to somehow encompass both to make a living, and we will never work another day in our lives.